Performers include: Blair Brown, Drew McVety, Richard Venture, Lewis Black, Mary Joy, Nathan Lane, Allyn Ann McLerie, James Greene, Davey McQuinn, and Christine Healy. Thirtysomething Molly Bickford Dodd (Blair Brown) is divorced and living on her own in the upper west side of New York City. Though she’s dating her boss, Dennis (Victor Garber), her jazz muscician ex-husband, Fred (William Converse-Roberts), is still in her life. But when Fred tells her he’s engaged to a Swedish cross-country-skier named Kirsten (Mary Stavin), Molly knows she’s not yet over what she and Fred once had. As her biological clock ticks, Molly explores many different careers, as well as many different men. Steady boyfriends like Moss Goodmann (David Strathairn) and detective Nathanial “Nate” Hawthorne (Richard Lawson) help make her days and nights all the more interesting. 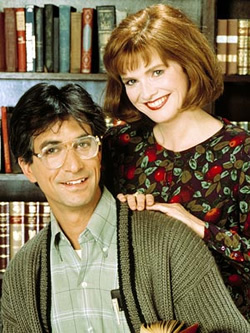 Reminding Molly that she isn’t getting younger is her mother (and narrator) Florence (Allyn Ann McLerie), father Edgar (Richard Venture), sister Maimie (Sandy Faison), brother Dwight (Darrell Larson), elevator man Davey McQuinn (James Greene) and best friend Nina Beth Shapiro (Maureen Anderman). Even her garbage man Nick Donnatello (show creator Jay Tarses) puts in his two cents about how Molly should live her life. Trying to find a career and a man to keep her satisfied takes its toll on likable Molly but when she sees therapist Dr. Judith Litchfield (Christine Healy) to help her cope with it all, she gets more than she bargained for.